With strong community ties, we’re proud to be preferred partners for a number of top insurance companies and adjusters. We have the distinct advantage of working directly with claims adjusters to ensure that your claim is covered and managed professionally. Beyond the advantages of using us to complete your roofing and exterior repairs, you’ll also get additional warranties that are often offered by insurance companies when a preferred contractor is chosen to complete repairs. Starting your claim is the first step to restoring your home to its former glory. Your insurance company will provide you with a claim number and give you an idea of when your home will be evaluated for damages. When starting your claim, you should immediately let your insurance company know if there have been any damages that may result in your home leaking. They will advise you on who will complete these repairs in a timely fashion. Once your adjuster has attended your home, they will provide you with an estimate for the cost of repairs to your home. Many insurance companies offer additional warranties when a “Preferred Contractor” completes your repairs. This also helps to ensure that you are protected through adequate liability insurance and up-to-date WCB on contractor employees. All estimates should be double-checked and confirmed by an experienced professional. Ensuring that all necessary damages are being covered appropriately is essential to restoring your property with care and craftsmanship. Finally, written authorization is required to complete any repairs. This is paired with selecting any new products and colours for the design of your home repairs. To learn more about how Epic Roofing can help you with new roof installations, roof replacements, roof repairs and roof maintenance for your home, contact us today for a free, no obligation estimate. We've been helping Calgary, Lethbridge, Red Deer and surrounding area homeowners like you for more than 16 years. HomeStars is Canada’s largest and most trusted contractor review site. From interior restoration to roofing & exteriors, Home owners trust HomeStars to find honest and reliable contractors. Based on ratings and reviews by homeowners that hired us, we’ve been selected as one of the best Calgary contractors of 2016. We’re proud of our quality service and workmanship, and our reviews reflect that. 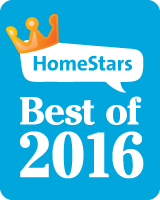 Visit HomeStars to take a look at some of our recent reviews, or leave a review yourself. Contractors communicate directly with your adjustor as required.